Relatively Geeky Network: SS #060 - 5 Years Strong! It's nothing compared to the Superman Fan Podcast, but it's something. THANK YOU! If we could have figured out a character who needed a lovely Scottish accent, you would have been our first call! 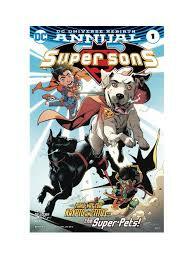 Yes, we LOVE LOVE LOVE the Super Sons! I kid, I’m not really that entitled.